Literature: The Human Experience provides a broad range of compelling fiction, poetry, drama, and nonfiction that explores the intersections and contradictions of human nature. Timeless themes such as innocence and experience, conformity and rebellion, culture and identity, love and hate, and life and death are presented through the context of experiences that are enduringly human. Diverse selections from contemporary and classic authors across time and cultures offer students opportunities to discover literature with which they can connect. A flexible arrangement of literature within each theme allows instructors to teach the text however best suits their classrooms, and the expert instruction and exciting selections will help to guide and entice even the most reluctant readers. Enhancements to the shorter twelfth edition include two new casebooks that help students to see how literature can make arguments as well as new reading questions that ask students to make arguments about the selections. To top it off, Literature: The Human Experience is value-priced, providing a wealth of material for an affordable price. 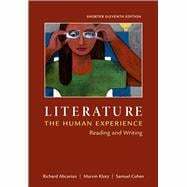 Literature: The Human Experience is also available with LaunchPad Solo for Literature, a set of online materials that helps beginning literature students learn and practice close reading and critical thinking skills in an interactive environment. Richard Abcarian (PhD, University of California, Berkeley) is a professor of English emeritus at California State University, Northridge, where he taught for thirty-seven years. During his teaching career, he won two Fulbright professorships. In addition to editing Literature: The Human Experience and its compact edition, he is the editor of a critical edition of Richard Wright's A Native Son, as well as several other literature textbooks. Marvin Klotz (PhD, New York University) is a professor of English emeritus at California State University, Northridge, where he taught for thirty-three years and won Northridge's distinguished teaching award in 1983. He is also the winner of two Fulbright professorships (in Vietnam and Iran) and was a National Endowment for the Arts Summer Fellow twice. In addition to editing Literature: The Human Experience and several other textbooks, he coauthored a guide and index to the characters in Faulkner's fiction. Samuel Cohen (PhD, City University of New York) is Associate Professor of English and Director of Graduate Studies at the University of Missouri. He is the author of After the End of History: American Fiction in the 1990s, co-editor (with Lee Konstantinou) of The Legacy of David Foster Wallace, Series Editor of The New American Canon: The Iowa Series in Contemporary Literature and Culture, and has published in such journals as Novel, Clio, Twentieth-Century Literature, The Journal of Basic Writing, and Dialogue: A Journal for Writing Specialists. For Bedford/St. Martin's, he is author of 50 Essays: A Portable Anthology and coauthor of Literature: The Human Experience. Hallman B. Bryant, Reading the Map in "A Good Man Is Hard to Find"
Emily Dickinson, I'm Nobody! Who Are You? Virginia Woolf, What If Shakespeare Had Had a Sister? Joyce Carol Oates, Where Are You Going, Where Have You Been? William Shakespeare, Sonnet 18 "Shall I compare thee to a summer's day?" William Shakespeare, Sonnet 29 "When, in disgrace with fortune and men's eyes"
William Shakespeare, Sonnet 64 "When I have seen by Time's fell hand defaced"
William Shakespeare, Sonnet 116, "Let me not to the marriage of true minds"
William Shakespeare, Sonnet 130 "My mistress' eyes are nothing like the sun"
William Shakespeare, Sonnet 73 "That time of year thou mayst in me behold"